This book has carried me through 20+ years of cooking and bears the dog-earred wear and tear to prove it! 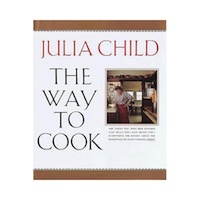 From basics like "how to boil an egg" (Julia's is the best method ever, btw) to cutting up a whole chicken, to cooking low-fat soups using pureed cooked rice...No matter what you want to cook, you can at least find a technique here if not a fabulous recipe. This is truly a cookbook staple to have in your collection.